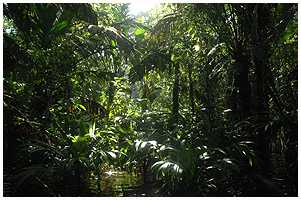 - pictures from 10 days in the end of january. 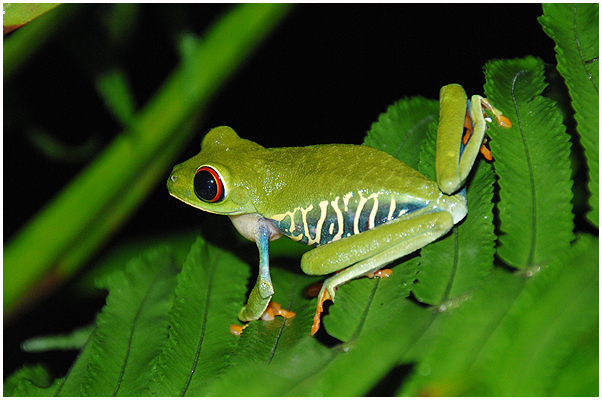 Agalychnis calidryas - Red-eyed Treefrog. 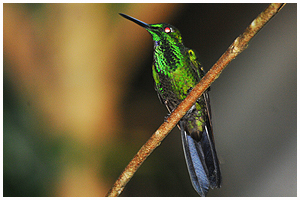 Hummingbirds are small and extremely fast fliers! 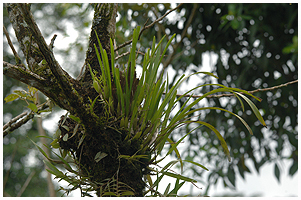 Bromelias - in trees all over the place - even in the city! 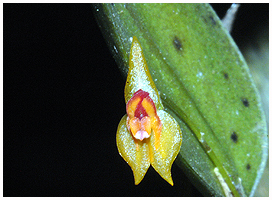 Restrepia sp - one of many small orchids flowering in the Monteverde Orchid Garden in St. Elena. 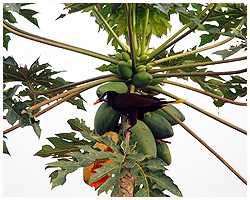 Psarocolius montezuma - a Montezuma's Oropendula feeding on the ripe Papaya fruit. 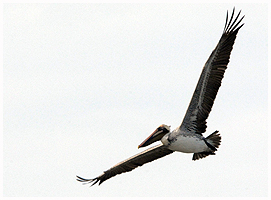 Pelecanus occidentalis - The Brown Pelican is a very common sight at both the Carribean and the Pacific coasts. 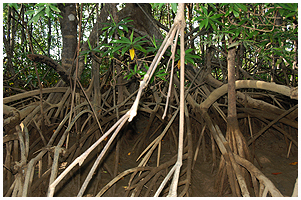 Mangrove trees have very specialized, impressive roots. 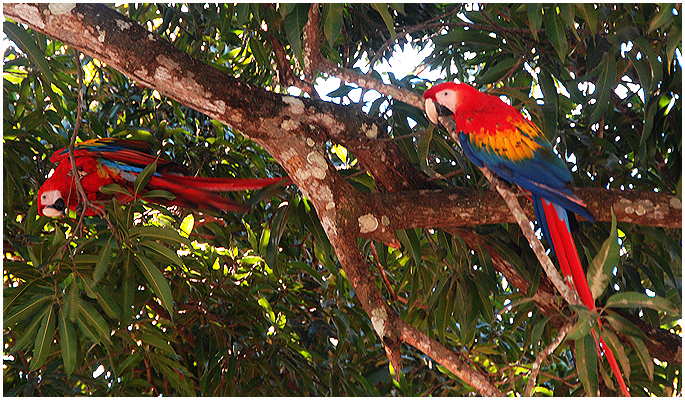 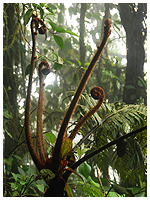 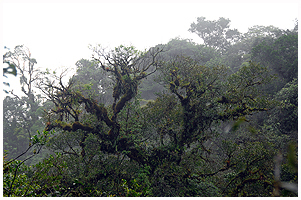 Treeferns are part of the cloud forrests in Monteverde. 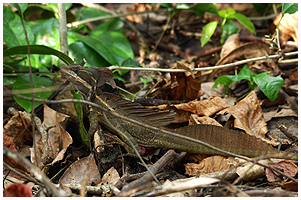 Basiliscus plumifrons - Green Basilisk - young specimen. 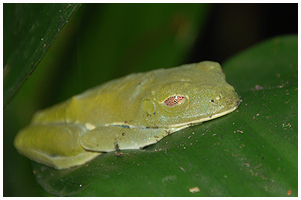 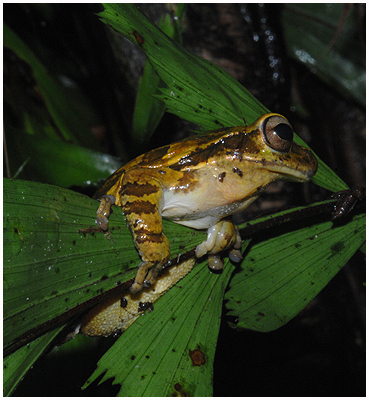 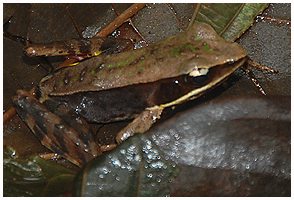 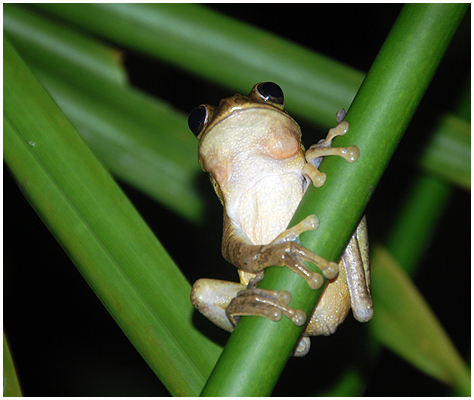 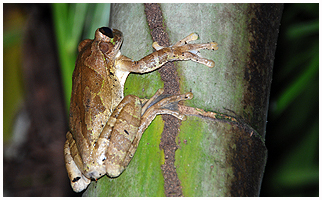 Agalychnis saltator - Mis-fit Treefrog. 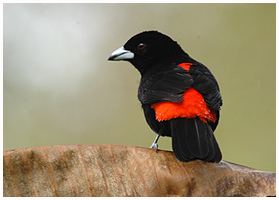 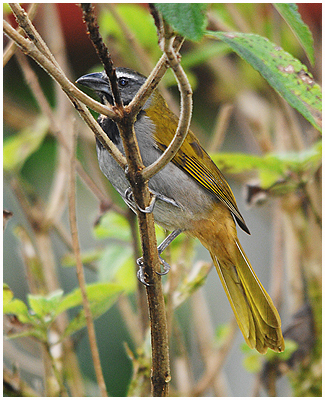 Ramphocelus passerinii - Passerini's Tanager. 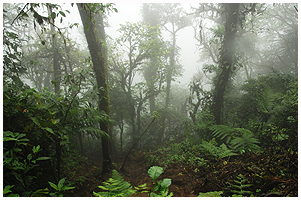 Cerro Chato Trail - the Volcano has been dormant for 3700 years, and the cloud-forrest is covering the steep slopes. 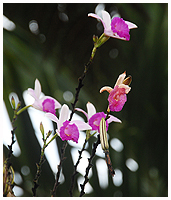 Orchids in almost every tree in the rain- and cloudforrests! 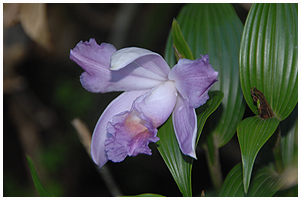 Sobralia are terrestrial orchids, that are found widespread in Costa Rica - even alongside many country roads in farmlands. 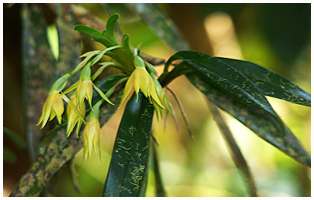 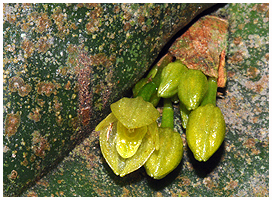 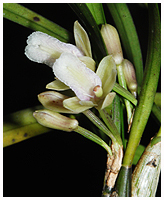 Sobralia are some of the first to colonize maturing lava fields on Volcano Arenal - along with some Epidendrums. 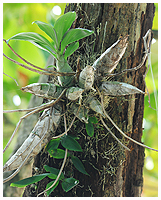 St. Elena Reserve - a small sprouting tree on the side of a fallen large trunk has grown large itself - a 1st. 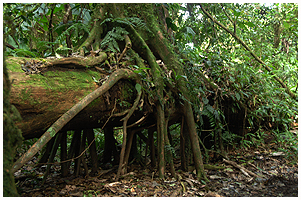 floor tree! 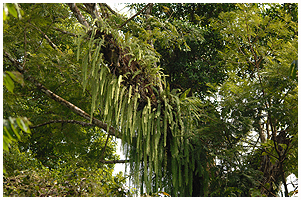 Epiphytes of all sorts covering the branches of every old tree. 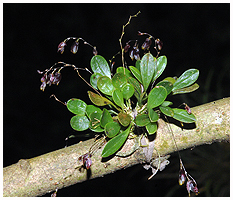 The heavy load breaks off both small and bigger branches. 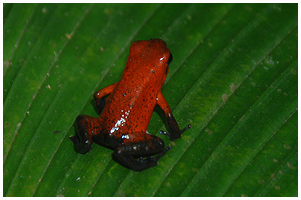 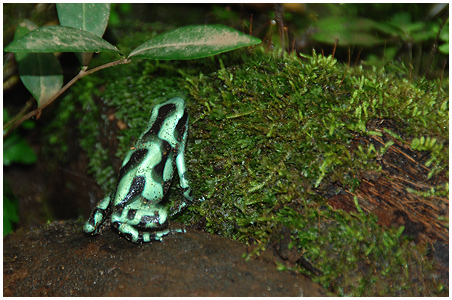 Dendrobates pumilio - Blue-jeans poison-arrow Frog. 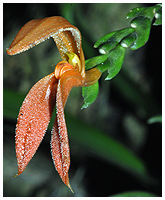 Heliconia visited by a very swift hummingbird. 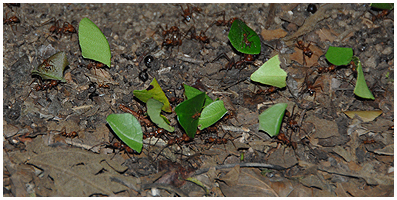 Atta colombica - Leaf-cutting Ants harvesting raw-material for their underground fungus-farming! 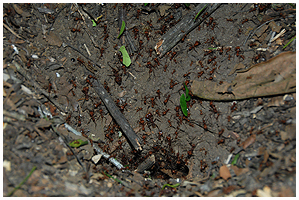 Atta colombica - there are several different species of Leaf-cutting Ants - and they work day and night! 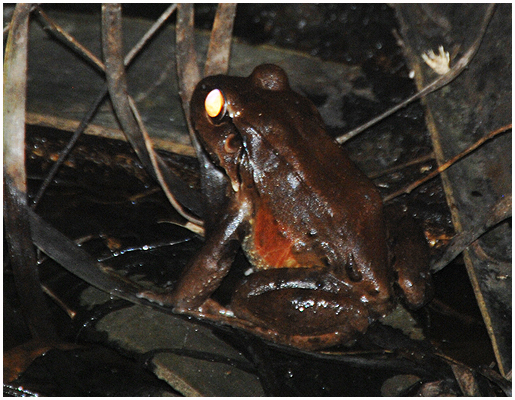 - Nightshift are the most active! 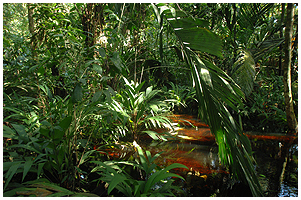 Atta colombica - the entrance to their underground World - easily stretching several meters to all sides. 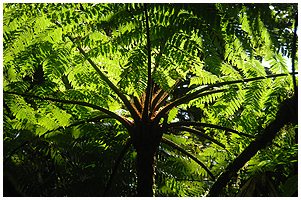 Treefern putting out the next generation of leaves. 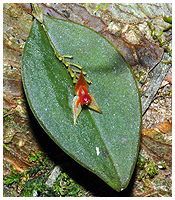 Heliconia with plantlets forming in the flower itself. 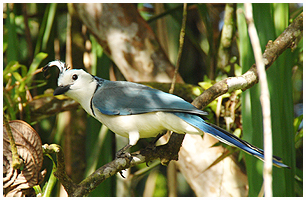 Egretta coerulea - a very common sight at the waterways. 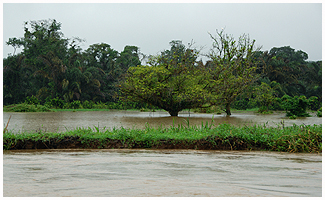 Tortuguero - flooding of the land due to heavy rainfall for days. 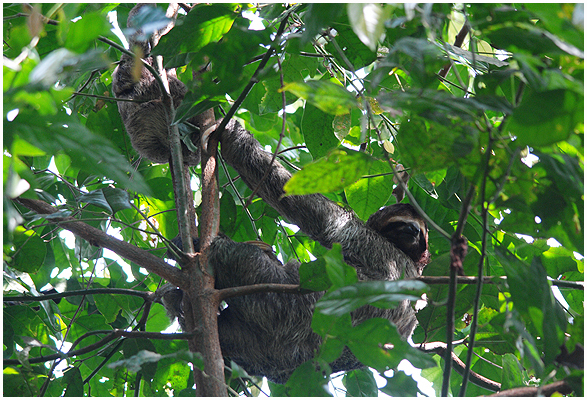 Choloepus hoffmannii - the Two-toed sloth. 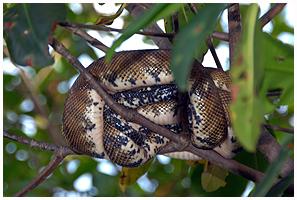 Corallus ruschenbergerii - The Mangrove Boa resting in a tree. 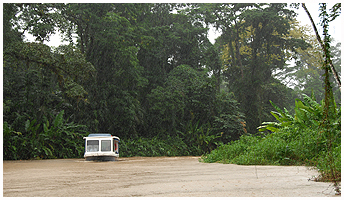 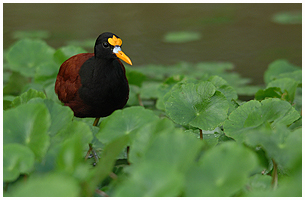 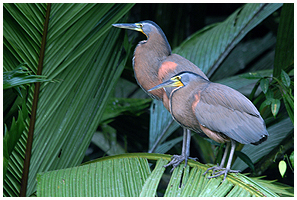 Tortuguero - the tours go on in the rain. 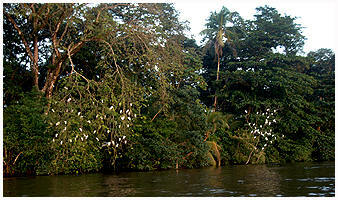 Tortuguero - I forgot the name of this spectacular and magnificent tree. 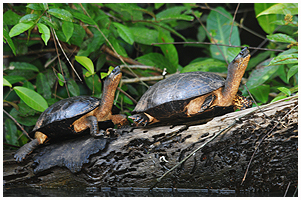 Rhinoclemmys funerea - Black Wood Turtles resting on a half submerged log in the river. 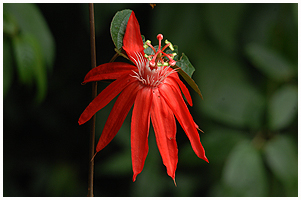 Passiflora vitifolia - Vine Leaf Passion flower really stand out in the rainforrest with the bright red color. 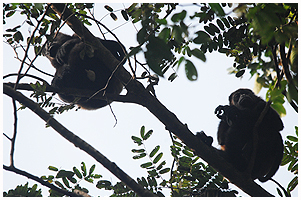 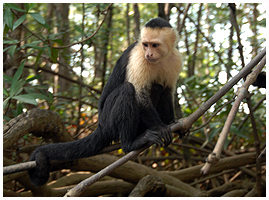 Cebus capucinus - White-faced Monkey. 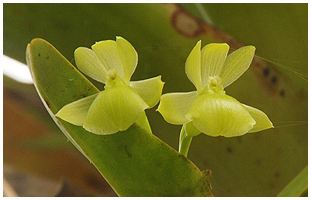 Far from all flowers in the rainforrest are orchids. 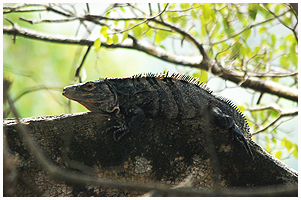 Ctenosaura similis - Black Iguana. 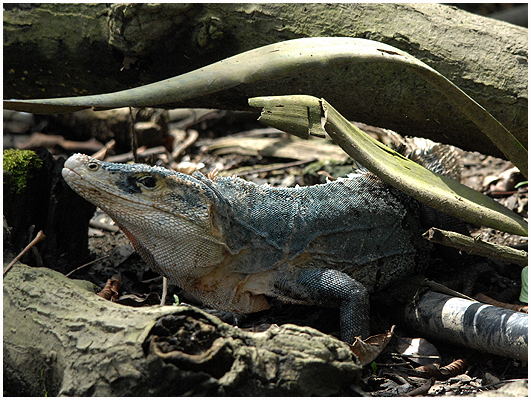 Ctenosaura similis - another Black Iguana - or is it? 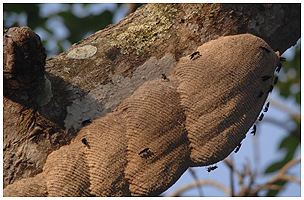 Costa Rican Wasps in a Manuel Antonio tree. 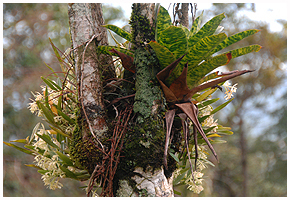 Epiphytic ferns and mosses are everywhere - and orchids will eventually join in. 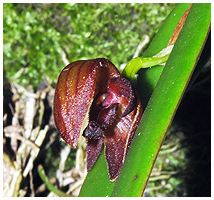 Small orchid from the Monteverde Orchid Garden. 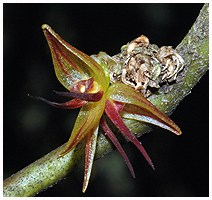 Hard to believe - two beautiful flowers on an even smaller epiphytic orchid plant on this tiny branch. 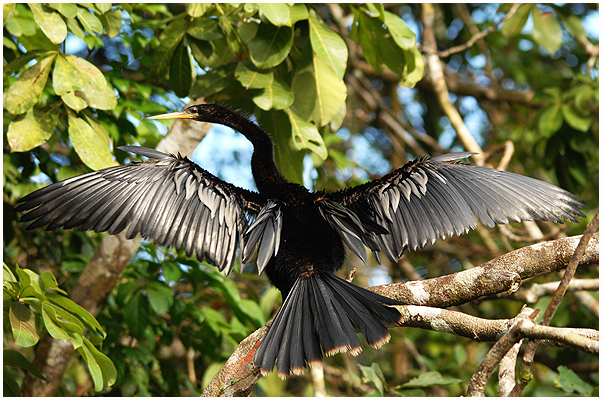 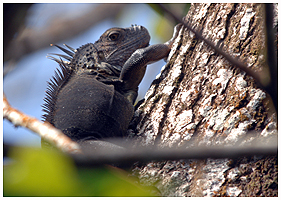 - A Black Iguana? 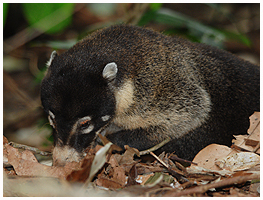 - I don't think so - snout too blunt, and horns on the nose. 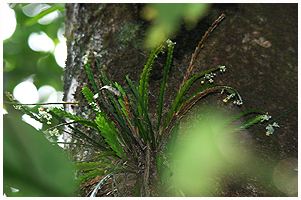 Marine-Iguana in Costa Rica?? 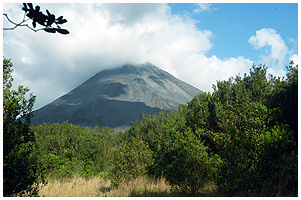 Volcano Arenal - still very active - but quiet for the moment. 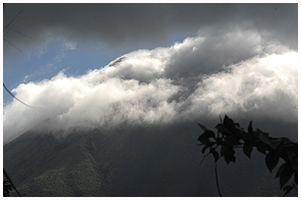 The Arenal Summit - a glimpse for a moment. 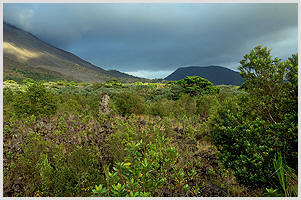 Cerro Chato in the background - lava from 1999 in front! 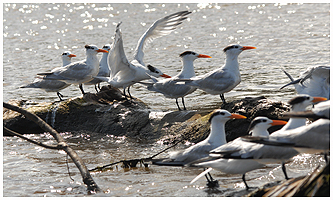 Terns - sorry - I don't know the right species name. 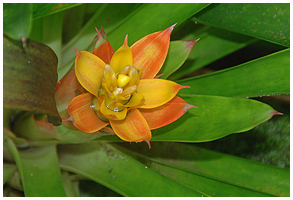 Bromelia - and even more Bromelia in different shapes! 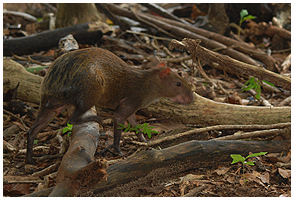 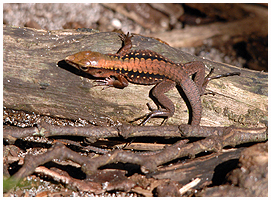 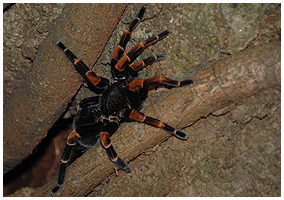 - a small fellow at Manuel Antonio National Park. 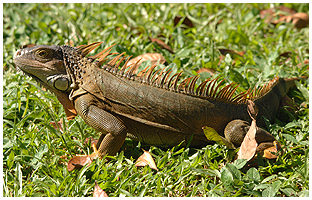 Iguana iguana - they are all over the place on the Carribean coast and lowland slopes. 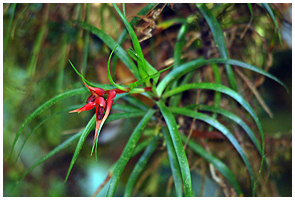 Bromelia - and more Bromelia with or without flowers! 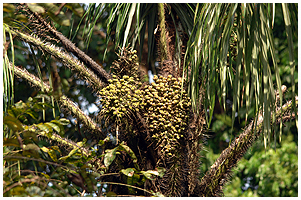 This spiny palm species is not exactly inviting visitors! 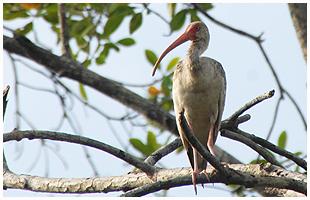 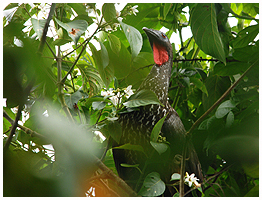 Eudocimus albus - a White Ibis in the Pacific Mangrove. 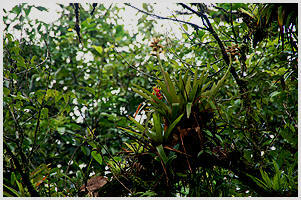 Bromelia - hundreds of different species in all sizes! 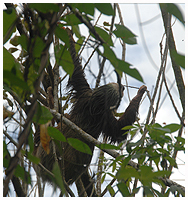 Bradypus variegatus - the 3-toed Sloth with a cob in Manuel Antonio National Park on the Pacific coast. 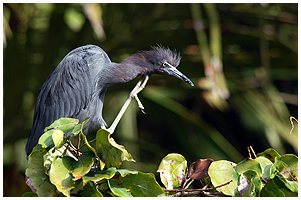 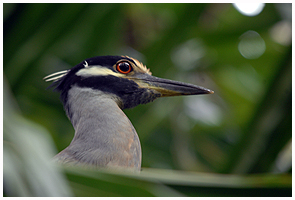 Heron or Egret sp. 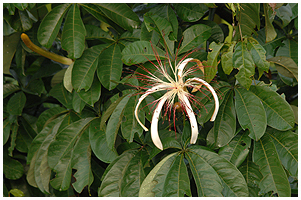 - but whitch one? 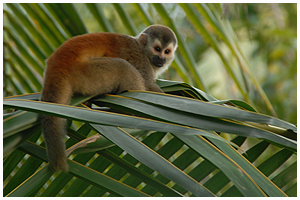 - It's not in any of my books. 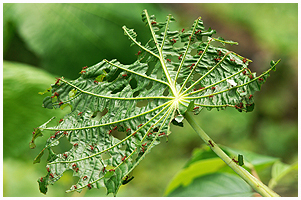 - Any Help? 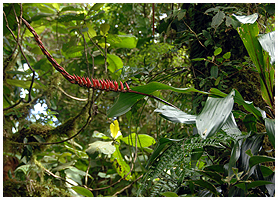 Heliconia - one of many spectacular and beautiful species in the Costa Rican forests. 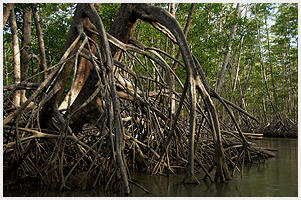 Low tide in the Mangrove, revealing the silt deposits building up between the roots of the mangrove trees. 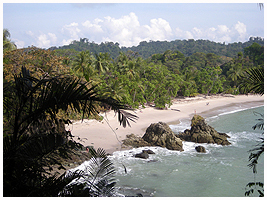 A Manuel Antonio beach - well before rush-hour! 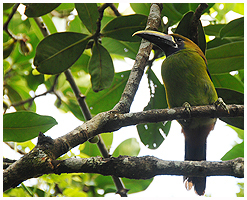 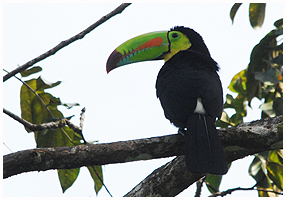 Selenidera spectabilis - this should be the rarest of all Toucans in Costa Rica - Yellow-eared Toucanett. 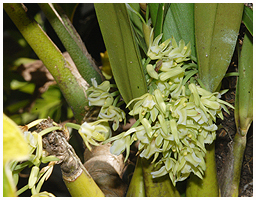 Fine orchid plant with tiny white flowers. 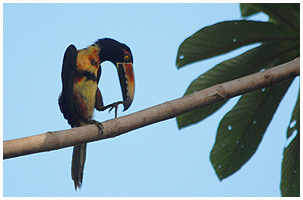 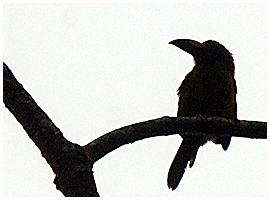 Ramphastos sulfuratus - the Keel-billed Toucan. 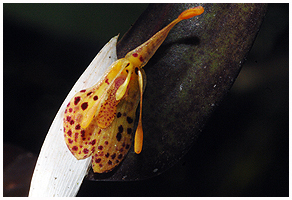 This was the most common orchid species found in the rainforrest this time - I believe, it's a Maxillaria sp..
Penelope purpurascens - we saw the Crested Guan at several occasions in the Arenal area. 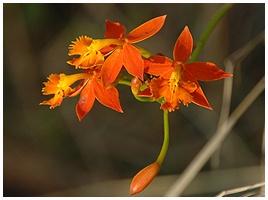 Epidendrum radicans - very common in old lava fields. 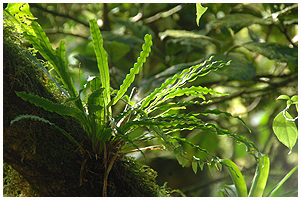 One of the many epiphytic ferns in Monteverde. 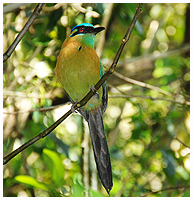 I'm not certain what kind of Motmot this is. 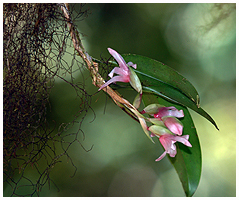 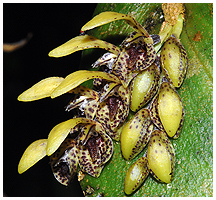 Clowesia is an orchid family known to grow well on rotten tree-stumps - and here it is spreading freely by seeds. 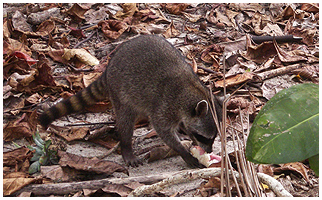 Procyon lotor - the Northern Racoon can be a pest - this one snatched a ham sandwich on the beach. 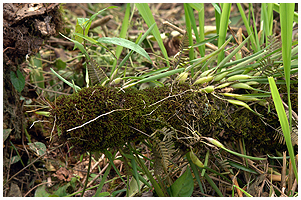 One of the small fallen branches from the canopy - with a thick layer of moss - and several nice orchid plants! 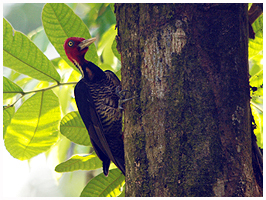 Back to www.carphunters.com / Animals © Copyright Kenth Esbensen. 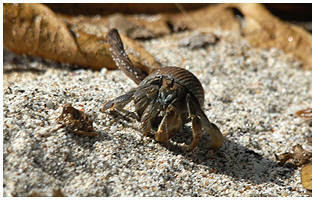 Contact: info@carphunters.com.